Immersed in northern New Mexico culture, author William deBuys has emerged as one of the region’s strongest storytellers, conservationists, and defenders. SEPTEMBER 1972. William deBuys rides shotgun through the high-mountain village of Peñasco. Old adobes, abandoned buildings, and weathered mom-and-pop shops huddle close to the potholed roadway and zip past the window, unfolding for deBuys a scattershot view of utterly unfamiliar surroundings. Flashing on the name of a roadside bar—El Norteño—deBuys mulls its deeper meaning. At 22, the American studies graduate thought he knew something of the Southwest. But as his friend’s Volkswagen pushes north toward Taos, deBuys’ perception of the local landscape, and his place within it, shifts. Northern New Mexico, he realizes, is unlike any other American place. Then I get it, deBuys will write later in River of Traps, his 1990 nonfiction collaboration with photographer Alex Harris, the friend driving the speeding VW. We are in the Southwest only from an Anglo point of view. The people who settled Peñasco came from the south, from Mexico, and before that, New Spain. These mountains were the northern frontier, the home of northerners, norteños. FORTY-FIVE YEARS LATER, the High Road to Peñasco and points beyond reflects the summer heat as cars wind and climb into an eye-dazzling vista of mountain and sky. The view is big, but the string of villages along the route suggests smaller worlds within. Nearing Truchas, a series of memorial signs launch a roadside narrative of deceased locals, loved ones with old, lilting Spanish names like Cipriano, Tranquilino, Rosalina, Sabinita. Just past Ojo Sarco, the radio mysteriously switches itself to a rocking ranchera on the Spanish station. Hey baby, qué pasó? Thought I was your only vato. The song trails into the turnoff to El Valle, a tiny village in the crescent-shaped valley of the Río de las Trampas where, with the exception of scattered years, deBuys has lived and written since 1975. Moments after leaving the asphalt, juniper and pine frame a veil of road dust. A camposanto, circa 1750, appears, aflame with American flags and plastic flowers. The cemetery is a dramatic reminder that life in this and other northern villages is rooted in the lands of long ago. And if that’s not enough, nearly four decades of deBuys’ writings readily remind us again. Since his drive-by epiphany about the norteño nature of his adopted home, deBuys has honed experience and expression into his singular sense of this place and its people—a physical and cultural geography he calls “the Deep North.” His series of six New Mexico–based nonfiction books illuminate the region as an equally beautiful and vulnerable ecosystem, encouraging native and newcomer alike to live responsibly within it. Other books and projects immerse readers in places farther afield, from California to Laos to Nepal. In each, deBuys blends refined skills of research and observation, a rich use of metaphor, and a balance of humility and humor to evoke a respectful, keenly felt connection to his subjects. 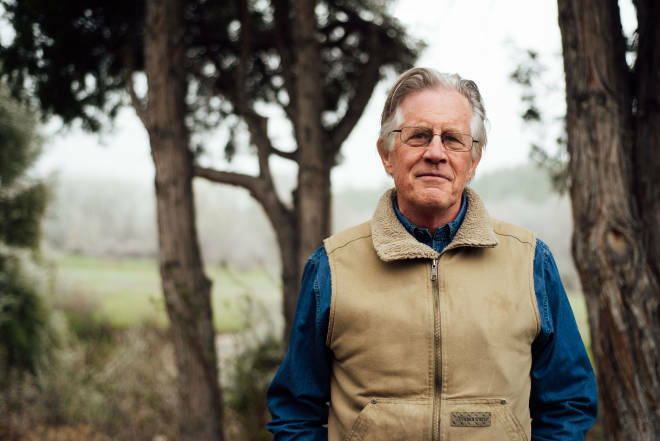 DeBuys’ passionately powerful prose, as well as his ongoing work in environmental conservation and social activism, have earned him international renown as one of the most respected environmental, cultural, and social historians of the Southwest. In September, the Pulitzer Prize finalist and Pushcart Prize winner received the New Mexico Governor’s Award for Excellence in the Arts, the state’s highest artistic honor. In letters of nomination, other notable writers and environmental figures lauded his writing, scholarship, and personal commitment to New Mexico, even placing him among such nonfiction and naturalist pioneers as John Wesley Powell, John McPhee, and Peter Matthiessen. Ethnomusicologist, environmentalist, and author Jack Loeffler, himself a Governor’s Award winner, described deBuys as one of the state’s “finest writers, clearest thinkers, and most refined ethicists.” Don Usner, deBuys’ co-author and photographer on the 2006 Valles Caldera: A Vision for New Mexico’s National Preserve, praised his choice of “projects aimed to effect positive social change.” And Melissa Savage, author and director of the Four Corners Institute, singled out deBuys’ “fine-boned prose” and “lifetime of engagement” in the rugged heights of the Sangre de Cristo Mountains. On this June afternoon, deBuys sits in the shade of his Deep North front porch, on his 40 acres of farmland. It’s but a few steps outside his compact, pitched-roof house, and a few steps more from the two-room adobe office where he writes. Immersed in blue sky and birdsong, the view from here makes clear that deBuys’ modest live-work space is merely a mortal practicality. It’s a gateway to the grandeur of the landscape—the hayfield, the cottonwoods, the river, the acequia, the meadow, the canyon, the pine forest, the beyond. It’s no idle boast. DeBuys knows more of his environs than most nativos, a fact with which both his El Valle neighbors and his readers would agree. In his soles—and his soul—he is every bit a norteño, a devoted student and steward of his surroundings. His easy conversation and eager hospitality feel no less than homegrown. THE SUBURBAN BALTIMORE house of deBuys’ youth backed up to a forested ravine. “The woods were my refuge. I spent a lot of time there alone,” he says. In the late 1960s, deBuys took courses in American studies and creative writing at the University of North Carolina. He absorbed literary histories and traditions inside and out of his Southern comfort zone, focusing his undergraduate thesis on William Faulkner. His studies gave rise to a prizewinning short story, his first published work. The tale involved an old man whose life was firmly fixed in a rural valley along a river that threatened to overflow its banks. The story, deBuys realized later, foreshadowed things to come. The terrain in his imagined tale was a lot like El Valle. And, in part, the story’s success brought him to the attention of Robert Coles, a preeminent Harvard psychiatrist who was living in Albuquerque, researching his book Eskimos, Chicanos, Indians. He hired deBuys and a young Duke University photographer named Alex Harris to assist. Their 12-month assignment: document local Hispano and Indian places and faces. It was a wide left turn from Chapel Hill to Chimayó, where, just months after graduation, the North Carolina newcomers ascended the High Road in search of a place to rent. Although a local realtor warned that any Anglo outsider hoping to live in northern New Mexico was looking for trouble, deBuys settled in Truchas, Harris in Peñasco. Harris quickly filled his days making photographs. DeBuys made a beeline to an Española bar and a beautiful woman, engaging in a fraught and ultimately failed love affair. A year later, he had nothing to show. DeBuys still felt like an outsider. Yet some sense of place resonated inside him. “I remember my first drive up the High Road from Chimayó to Truchas, thinking those shrubby piñon-and-juniper-stippled hills and that pink degraded granite soil were so ugly,” deBuys says. “And now, to me, they’re supremely beautiful. In that first year, my aesthetic completely shifted.” Still, driving away from this bewildering backcountry, deBuys had no intention of coming back. El Valle, 1975. DeBuys explains his morning writing practice to Jacobo Romero, the old man who lives next door. Romero is curious, gregarious, as grounded in his place as the old man in the prizewinning short story from deBuys’ undergraduate days. Much of Romero’s world also revolves around water, a small and vigorous Río de las Trampas (River of Traps), which feeds the life of his ancestral village. From it flows a cedar-lined acequia, a centuries-old irrigation ditch. On this, and most summer mornings, Romero deems ditch work, as well as cattle herding, fence building, hay harvesting, horseshoeing, hoe sharpening, and other old-fashioned farmwork, far nobler labors than deBuys’ efforts to turn type into mountains. In time, the trails led to graduate school at the University of Texas at Austin, where deBuys parlayed his research into a master’s and a doctorate, leading him to complete Enchantment and Exploitation: The Life and Hard Times of a New Mexico Mountain Range. The 1985 book explores the essential humanity of the land. He wrote: The trick of living in the mountains begins with understanding the power of the landscape and the limits it imposes. By extension, the region’s history begins with the story of how people have learned that lesson—and at times forgotten it. It was an unusual invitation, particularly at a time when many local Hispanos were resisting the incursion of hippies in northern lands. But deBuys and Harris were not exactly hippies. Each was engaged in a demanding craft, committed to a work ethic that Romero respected. When the deBuyses and Harris decided to purchase farmland at the bottom of the valley, where they would eventually build houses, raise children, and share the land’s labors, Romero didn’t resist. He gave them entrée to his village and to the old ways of his people, for the simple reason that they were willing to work hard alongside him. Over 10 years, Romero tested their mountain mettle in all weather, even as jobs or children took them temporarily elsewhere, even as raging floodwaters threatened to wash their wondrous patch of earth away. When Romero died, in 1985, their bond was deep, the loss devastating. The pair preserved his spirit and his wisdom in their 1990 River of Traps. The book won acclaim for capturing New Mexico’s cultural complexity through the experience, grace, and grit of a genuinely old-time norteño. In 1990, it was selected as a New York Times Notable Book of the Year, and in 1991 it was a finalist for the Pulitzer Prize. Today, both it and Enchantment and Exploitation remain highly regarded New Mexico classics. To his dying day, Romero never understood deBuys’ reason for sitting indoors, typing, as the sun rose over the Sangres. Yet for deBuys, in literature and in life, the old man was the character of a lifetime. I used to whether I belong here. And I have no plans to go away. In deBuys’ 2007 memoir The Walk, the author traces the circuit of his daily passage through El Valle to craft a profoundly inspired work of history and meditation. As he guides us through the topography of his village, he accesses a more interior trail, a path carved in delicate steps of love, family, divorce, and the loss of a beloved horse. In this way, a homely, well-worn path becomes a route into and through the self, leading to destinations unimagined. “Just as Jacobo was such an important mentor in my life, this land has been a mentor,” he says. “It’s taught me that I should live alertly.” DeBuys’ expertise has been supported by complementary work in conservation and education. Over the decades, he has served as professor of documentary studies at the former College of Santa Fe, executive director of the North Carolina Nature Conservancy, and program officer for water projects and rural livelihoods for the New Mexico Community Foundation. His conservation work permanently protected more than 150,000 acres of wildlands in North Carolina and the Southwest. Every experience, he says, expands his community network, nourishes his environmental knowledge, and feeds the well of his writing. “I’m really lucky,” he says. “Part of my work ethic is to work hard to try to justify the good fortune that I’ve received, and to give something back in exchange.” His activism includes pointing out the extremes that threaten the region’s natural and cultural riches—climate change, poverty, the extinction of traditional lifeways—often with an aim toward shifting public policy. His 2011 book A Great Aridness: Climate Change and the Future of the American Southwest and the 2016 film The Colorado, which he co-wrote, enhanced and advanced the conversation on climate change. With a forthcoming collaborative investigative journalism project conceived by deBuys, he intends to stir dialogue, raise public awareness, and improve child well-being in New Mexico. DeBuys’ latest release is First Impressions: A Reader’s Journey to Iconic Places of the American Southwest, co-authored with the late borderlands historian David J. Weber. The book surveys 15 sites as described in historical accounts by explorers and settlers. Its title takes the conversation back to deBuys’ first impressions of norteño life along the High Road—where his own life and writings are now solidly embedded in its history.